A recently-felled pine beetle-infested tree in Hubbard County Park. The southern pine beetle, an invading species with a love for pitch pines, has made itself at home in Long Island’s Pine Barrens, after first showing up on our island in 2014. But that doesn’t mean that forest managers here are giving up. A consortium of state and local agencies, led by Molly Hassett of the New York State Department of Environmental Conservation, has been on the ground and in the air over the Central Pine Barrens since the beetle first arrived, pinpointing infestations and quickly cutting down infested trees to help stop the beetles’ spread. 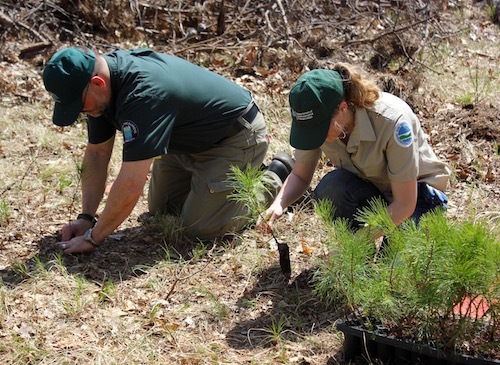 John Pavacic of the Central Pine BarrensJoint Planning and Policy Commission and Molly Hassett of the DEC plant saplings at Hubbard County Park May 3. In the fall of 2016, with the help of the Long Island Native Plant Initiative, the agencies began collecting seeds from local pitch pine cones here, germinating them in a DEC nursery in Saratoga Springs. Now, four years into the infestation, the agencies have brought the saplings back to Long Island to replant areas where infested trees had been felled. Representatives from the Central Pine Barrens Joint Planning and Policy Commission, Suffolk County Parks, the DEC and many local municipalities gathered at Hubbard County Park in Flanders on the afternoon of May 3 to talk about the progress of their work. DEC Forrester Nate Hudson searches for southern pine beetles in an infested tree he had just felled. Suffolk County Parks Environmental Analyist Nick Gibbons said the 4,000 acre county park, at the epicenter of much of the pine beetle damage on the East End, is also one of the most environmentally sensitive — four creeks within the property wend their way to the Peconic Bay. It was the first county park to be hit by the beetle back in 2014. He said 10,000 trees have since been infested with the bugs in Hubbard County Park and nearby Sears Bellows and Munn’s Pond county parks in Hampton Bays. Forest managers stop the spread of the beetle by cutting down infested trees, depriving the beetles of their food source — the cambium layer of the trees that contain its circulatory system, the xylem and phloem that carry water and nutrients throughout the tree. 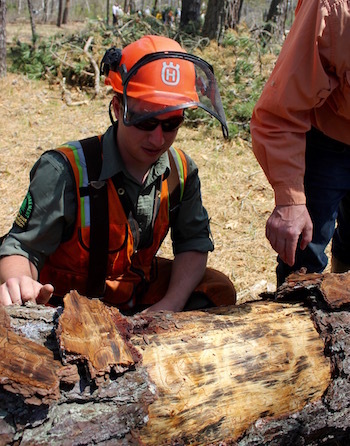 The managers also cut down trees surrounding the infestation, depriving the beetles of the pheromone trails they would otherwise follow to find new, healthy trees. The coordinated agencies also work together to do aerial surveys of vast swaths of the Central Pine Barrens, looking for the telltale orange to red to brown progression of needle color that points to a beetle infestation. Ms. Hassett said that process, from needle-color change to the death of a tree, can happen in as little as four to six weeks. “Work on such a large scale is very expensive, and very labor-intensive, and they’re spreading east,” said Mr. Gibbons. “Galleries” in the cork cambium on the back side of the bark of a tree, a sure sign of southern pine beetle infestation. The DEC recently awarded $275,000 in grants to five communities in Nassau and Suffolk counties, including $64,000 for pine beetle management in East Hampton’s open spaces, mostly in the Northwest Woods, and $28,050 for Southampton Town to remove hazardous trees at Good Ground Park and Foster Avenue Park in Hampton Bays. 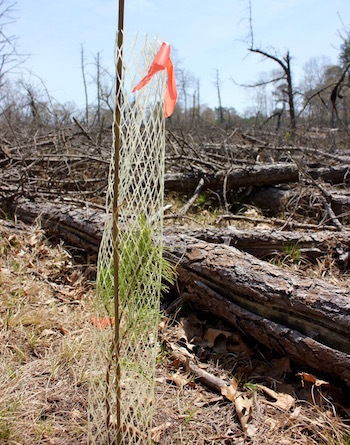 Ms. Hassett, who serves as the incident commander for the consortium of agencies fighting the beetle, said it was unlikely new trees would germinate after the cutting, because, in nature, pitch pines are dependent on the heat of a fire to open the pine cones and allow them to drop their seeds, and are also dependent on the bare ground caused by a fire to germinate, hence the necessity of growing seedlings in a nursery for replanting in the absence of fire. “We’re putting them back in the ground to make the Pine Barrens whole again,” said Mr. Gibbons. “This is a prime example of how agencies can work together,” said John Pavacic, the executive director of the Central Pine Barrens Joint Planning and Policy Commission. But the pine beetle, he said, isn’t going to give up without a fight, at least not in our lifetimes. “It’s here to stay,” he said.